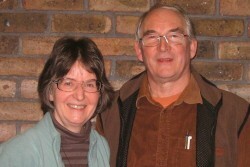 George and Sheila Green came to visit Hands at Work in Swaziland in 2007. An organic relationship of prayer and support has grown from there with their church, Hands at Work and a small community of women and men caring in Swaziland. Recently George Snyman from Hands at Work was able to visit and encourage their rural church: St John’s in Heath Hayes, Staffordshire, UK. Below is George Green’s account of their story. For two years now, our small church in Staffordshire, UK, St John’s Heath Hayes, has supported Hands at Work in Africa, with a particular interest in one community based organisation in Swaziland: Asondle Sive Bomake (ASB). This relationship developed when my wife, Sheila and I visited their community and worked briefly with their coordinator, Nomsa Lukhele. We have at times felt embarrassed that our church’s donations are quite small in proportion to the needs we saw. However, through the phone text messages and emails which pass to and fro between Swaziland and Heath Hayes, we have come to realize that our prayers, our continued interest and our advocating on behalf of ASB has meant as much to Nomsa as the money we give. It is also surprising how far, what seems like a small amount of money, goes. Some people i n UK are suspicious that aid given to Africa is ineffective; that you don’t know that it gets to those who really need it. Our communications and contacts with Hands have been so good that we can truly say where donations go, and demonstrate to others the results. And we really believe that St John’s benefits too from the relationship. There are many small churches like ours, with elderly congregations (more pensioners than wage earners). These, often rural churches, can start to look inwards. We are determined to keep looking outwards: That’s our mission. Yes, we need to raise funds to keep our own church going, but Hands at Work reminds us what we are here for, and how we can effectively be neighbours to people on the far side of the world. In this age when the small churches are competing for time and attention with Sunday activities like shopping, football, horse-riding, theatre group—we need to make a continued effort to reach out towards children and young people in our communities. Thanks to Hands, we are able to go into local schools, do assemblies, and teach about Africa, about aid, and about how Christians express their faith in action. These are subjects which many teachers appreciate help in delivering. So, our church plays the role of servant, in more than one way.